I will be the first to say that for the longest time, I was never really such a huge fan of red. I thought it was too bright and too overpowering, too out there and way way too noticeable. Which I chuckle at a bit when I think of it now because it is the very reasons why I used to hate red are the same reasons as to why I love it now. Being a soft, pastel pinks (and colors) aficionado, I have always leaned to softer, more girlier pastel colors. You know, those soft I-wouldn’t-hurt-a-fly and you can find my twirling in some meadow look. And while I still absolutely adore soft pinks and pastels, I think I’ll be heading straight to the red color coded sections of stores this season. I’m laughing a little while writing this because I am already imagining my friends saying to me “of course this would your first reason”. If you have been a long time follower of my Instagram, or even just started following me recently, you will notice that I travel a lot. Not only do I travel a lot, but I photograph my travels a lot. One of the biggest things I am trying to work on is being more vibrant and present in photos. Instead of blending in with the environment, I want to make sure my viewers can see me in the photo! It adds a more human touch, plus red against any travel photo worthy shot just has that I traveled all the way here to take this photo and I look like a pro doing it, but I won’t tell you that it was struggle city to get here factor. Do it for the gram, am I right or am I right? In terms of Fashion, red just stands out plain and simple. 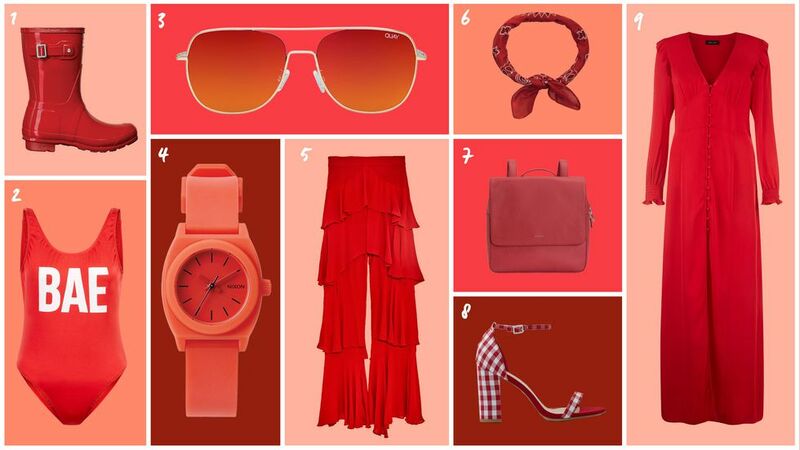 When you want to make a statement whether it is in your day to day life or in a big room (read: fashion week), red is your go to. Whether it is a strong red lip or even a bright red coat, red anything added to your look is just sure to leave a lasting impression. And oh they will remember you alright. Red is associated with Passion, Fierceness and Intensity (in terms of being filled with energy and thrill), and I am all about that! I think this may be one of the biggest reasons why I am so into red this season. There is just something about the color that makes me feel like it is an accurate representation of passion and the chase of what sets your soul on fire. I vowed to be unapologetic in 2018. Passionate, fierce and intense--putting my 110% energy into everything and ONLY doing things that sets my soul on fire. Hell, maybe red might even be my color of the year. Okay I think this one is definitely one of those yeah, it’s just you Paula situations. But for some reason, when I think of what color first comes to mind when I think of NYC, it is always, without a doubt red that comes to mind. Maybe it is the inherent sassiness of New Yorkers, maybe it is the infectious cutthroat passion that seems to run so strongly through a New Yorkers veins or maybe it’s even just the fact that NYC is the “Big Apple”...apple’s are red…. NYC = Big Apple = Red?! Am I the only one making this connection?! Okay maybe that last one was a stretch. Nevertheless, can you now see why R E D is my color of the season? Do we share any in common? Would love to know about your color of the season below!